There is arguably no better place to celebrate spring after the long dark days of winter than in Amsterdam, home of the ultimate spring flower: the tulip. With the warm days coming up ahead next week, we thought it was time to inspire you how to get in the spring of thigs. But aside from admiring the city in full floral bloom, there’s no shortage of enjoyable things to do in Amsterdam this time of year. From enjoying the best seasonal foods to scoring some art to give your home a spring makeover, or attending a festival after strolling through some of the prettiest parks, there are so many ways to make the most of the city’s best season. The most revered spring food in the Netherlands is without a doubt white asparagus (also called witte goud or “white gold”) and you’ll be sure to find the classic preparation with Hollandaise sauce, ham and egg at many restaurants at this time of year. But you can also kick off Dutch asparagus season over an asparagus-themed Boozy Brunch at Brooks on 29 April (Beethovenstraat 43, brooksamsterdam.nl), while your kids eat and play in a nanny supervised “kid-friendly zone”. Or why not try something different? At Asian-fusion restaurant MOMO (Hobbemastraat 1, momo-amsterdam.com) the spring menu includes a sushi roll with asparagus and avocado and steamed asparagus with black bean sauce. Spring is the perfect time to give your walls an artsy makeover by visiting one of the many ateliers in the city. On 19, 20 and the 21st of May Open Ateliers Jordaan has a special route along all the various artists and their ateliers in this picturesque part of town. While Amsterdam is reinventing itself as a culinary destination, food and drink festivals are blossoming. Grab a beer at the Meibock Festival (22 April, Posthoornkerk, Haarlemmerstraat 124- 126, pint.nl), where you can try over 35 spring beers from across the Netherlands and Belgium. Or catch the 11 th edition of the popular food truck festival Rollende Keukens (“Rolling Kitchens”), where live music, mobile kitchens and an easy-going vibe come together in a relaxed park setting (9-13 May, Westergasfabriek, rollendekeukens.amsterdam). Is there any other fruit more synonymous with spring than the strawberry? Harvest your own local strawberries, fresh off the vine at Fruittuin van West (Tom Schreursweg 48, fruittuinvanwest.nl) an organic orchard that’s also brimming with other seasonal fruits. Before you head out, do check the website, because there’s generally an update about which fruits are ready for the picking. With great terraces, markets, and festivals, there are plenty of reasons to head to Amsterdam’s parks this spring. While you can feed the adorable ducklings at almost every Amsterdam park this time of year, if you head to Amsterdam Forest you get to bottle-feed kids (of the baby goat variety) at Geitenboerderij Ridammerhoeve (Nieuwe Meerlaan 4, geitenboerderij.nl) an organic goat farm situated in the park. And do pick up some goat’s cheese while you’re there! Or shop till you drop at the funky Sunday Market (4 March, 1 April, 6 May) in Westerpark or at organic-focused Pure Markt in Frankendael Park (25 March, 29 April), Amsterdam Forest (1 April) or Amstelpark (8 April). In Westerpark, the musical HELLO AGAIN will kick off the Amsterdam LGBTQ Film Festival at Het Ketelhuis (8-18 March, rozefilmdagen.nl). The techno dance festival Awakenings Easter Special also takes place in Westerpark (31 March, awakenings. com/nl/en). If you’re in town on King’s Day (27 April) head to Vondelpark for the charming children’s free market, during which the city’s tiniest traders and entertainers get to flog their old toys or put on a show. Some of the city’s best outdoor patios can be found in its parks. Vondelpark3 (Vondelpark 3, vondelpark3. nl), with its sprawling terrace, is great for people watching, Distillery ‘t Nieuwe Diep (Flevopark 13a, nwediep.nl) a charming pondside hideaway in Flevopark is the perfect place to try locally distilled jenever, PARK Café-Restaurant (‘s-Gravesandestraat 65, parkcafe-restaurant.nl) offers a bird’s eye view over pretty Oosterpark, and WestergasTerras (Klonneplein 4-6, westergasterras.nl) looks out over the water gardens and former gasworks, with room for the kids to run around. While most tourists opt for the famous sight-seeing cruises, a much more interesting way to explore the canals is to Cruise Like A Local. An unique opportunity to cruise through the smaller canals and discover sights that are normally overlooked. See Amsterdam like never before. Cruise like a real Amsterdammer. Book your ticket right here. A boat tour is one of Amsterdam’s most popular attractions. Discover the UNESCO World Heritage Canal Ring in style. Spring celebrations are traditionally all about nature coming alive, and Amsterdam is no exception. Visit the beautiful cherry blossom trees in full bloom in the Amsterdam Forrest. The Tulip Festival (31 March, tulpfestival.com) showcases some 500,000 tulips in the gardens of private homes, museums and city institutions. Or follow the 8 km Elm Route−from the elm arboretum in Noord to Hortus Botanicus (one of the world’s oldest botanical gardens) in De Plantage− during the enchantingly-named Spring Snow Festival (20-22 April, springsnow. nl/en), which marks the annual blanketing of Amsterdam’s streets under elm blossoms. Besides that you can also visit The Keukenhof, the biggest flower garden in the world. Walk along beautiful colorful tulips and take breathtaking pictures in limited-time-only attraction. Spring weather can be unpredictable, going from blustery to beautiful in minutes, so if the half-hour schlepp by train out to the nearest beach seems like too much of a gamble, why not head to one of the city’s urban beaches? Located on a former wharf in Noord with fantastic IJ-views, hip Pllek (Tt. Neveritaweg 59, pllek.nl) plays homage to its roots with buildings created out of shipping containers and benches made from old boats. Set on a sandy peninsula, hippie hangout Blijburg (Pampuslaan 501, blijburg.nl) is Amsterdam’s largest city beach, with bonfires, live music, and a lively clubhouse. Cultural breeding ground Roest ( Jacob Bontiusplaats 1, amsterdamroest.nl) offers an edgy alternative with picnic tables and beach sand at a converted industrial site in Oostenburg. Hidden behind the RAI Convention Centre, Strandzuid (Europaplein 22, strand-zuid.nl) brings the beach a whole lot closer to the city. With its Balinese beach beds and golden sand, it’s the ideal spot for mid-week beach breaks and bouts of impromptu beach volleyball. One of the latest and lesser-known locations, Sloterplas Beach (President Allendelaan 2) offers a calm lakeside oasis in Nieuw West. 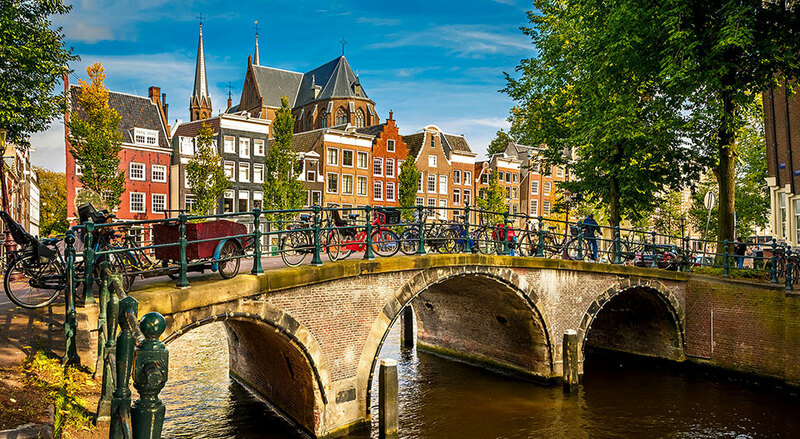 Sure you can act like all the other tourists and head right for the Rijksmuseum or Red Light District, or you can discover Amsterdam like a local. If picture perfect vistas are what you’re after, grab a ferry to the IJ River’s north shore, where you’ll find dainty dike houses and historic locks along the medieval Nieuwendammerdijk. Then cycle along the dyke to Durgerdam, a quaint harbour village and Dutch farmlands beyond. One of the most foolproof cycling routes simply involves following the beautiful west bank of the Amstel River, which will take you along lush green farmlands, old manorial estates and a famous windmill to the pretty village of Ouderkerk aan de Amstel, where you can grab a bite to eat before heading back along the east side of the river. If you continue cycling past Ouderkerk aan de Amstel, you’ll reach the Zomerbloemenpluktuin (Amsteldijk Zuid 183 b, zomerbloemenpluktuin.nl), where you can pick your own daffodils in early spring, and later tulips – there are over 25,000 in 45 colours! – as well as alliums, peonies, and other flowers. And because you get to pick the flowers with their bulb attached, once they’re done blooming, you can take the bulbs home with you to plant in the autumn.